This may have been brought up elsewhere, I’m new, so excuse me if this has already been discussed. In order to operate the prefab mk2 plant, I need settlers. To get settlers I need either the settler domicile or the barracks. Both of which require BTA to build, but to make BTA one needs a prefab mk2 plant. I couldn’t find any exchanges selling it to get the loop closed. So, is this a broken loop or am i just missing something? Hmmm, ok, don’t know how i missed that, but thanks for the reply. Also note that the PP2 requires staffing by both Settlers and Pioneers. If you cannot meet the full staffing requirements (by not having settlers), the facility will still operate, but at a reduced efficiency. You can see a similar loop requirement with the PP3 and HB3/HBC. 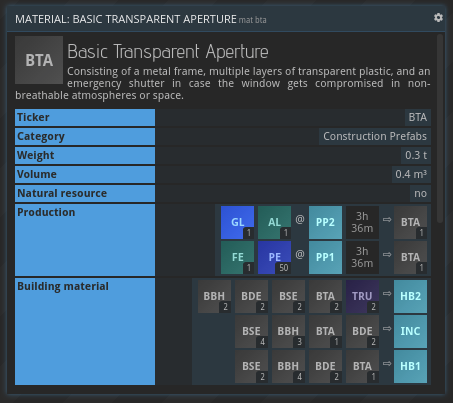 HB3 and HBC require reinforced prefabs. The PP3 will run at a reduced efficiency until the player can construct the hab modules.